You are rolling down the road, a green light ahead with a clear intersection. In an instant, you pick up a vehicle out of the corner of your eye. It fails to stop for the red light and slams into the side of your truck. Your truck begins to spin sideways, but you recover and manage to pull off to the shoulder to check on the other driver. Amazingly, you are both unharmed, but the person who hit you insists the light was green for them and you were in the wrong and should pay for the damage. You have to call your dispatcher and tell them what happened. What do you do? What the other driver doesn't realize is that your truck has a road-facing dash cam which has automatically saved the footage before and after the impact. There is no need to argue roadside, that will be something for the police to sort you, you know that the camera captured your side of the story. Now, let's revisit the same situation and imagine how different this situation could've gone if you didn't have video evidence of the accident. Cameras are starting to be implemented into vehicles at a much higher rate. To not only make sure the driver is safe but when something does happen there are no discrepancies in the facts of the story. Each camera serves a different purpose for the driver and the carrier. Sometimes companies outfit their trucks with specialty cameras to review cargo or other angles; these are the three most utilized in the trucking industry and the ones we will discuss. Many drivers are firmly against this camera; they feel it is an invasion of their privacy. The fact of the matter is companies implement this camera not to invade privacy, but to protect their drivers and their company as well. 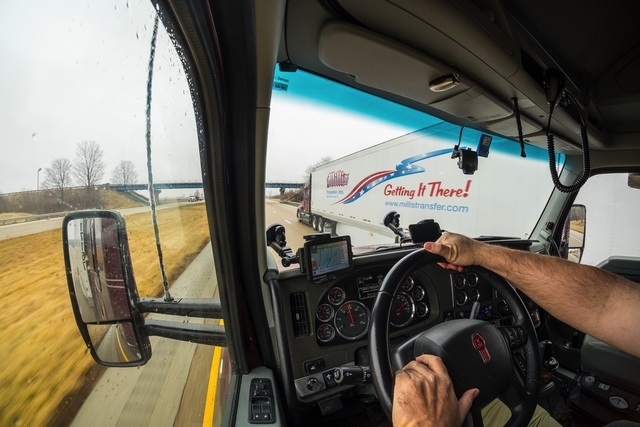 Let's say the Safety Manager of a fleet suspects one of their drivers texting while driving and reviews the footage to see what is going on in the cab. With video to back the manager up, he can discipline the driver following the company's safety policy which might include training, penalties or termination. This proactive approach to safety not only saves money and reduces headaches in the long term, having a firm policy and action plan in place helps during an audit or accident investigation. In the example that we talked about at the start, when the truck driver collided with another vehicle at the intersection, a road-facing camera can help investigators and insurance adjusters with an unbiased look of the events. Having your company's name on the side of the truck puts you at a disadvantage and can make you a target, and often you are forced to accept the complaints called in about your drivers as the truth. This one camera can help set the record straight and build trust between you and your drivers, plus if you are required to use an ELD, many devices are shipping with a camera built-in. This camera is a staple in many modern vehicles nowadays. It makes it much easier to reverse since you can have a live look in at your surroundings. Commercial vehicles do not have a rear view mirror, which as you can imagine makes it difficult to drive in reserve. Before reverse cameras became mandated for vehicles under 10,000 GVWR, drivers had to rely on their side view mirrors and their instinct. Now that companies are seeing the benefits of these cameras they are starting to become more abundant in the trucking industry. This type of camera helps protect the truck from being damaged while reversing or injuring anyone or anything behind the truck. Tracor plus trailer can range from 60-80 feet long which is a lot to handle when driving forward, in reverse this task gets exponentially harder. So implementing this type of driver aid reduces driver stress, which in turn creates safer driving. Creating a safety culture in this trucking industry is a significant component of the success of any company who has a fleet of vehicles. While individual businesses may not need all of these cameras, we can all agree that they greatly help with driver safety. Talking to many business owners with a fleet who have utilized cameras, it is rare to find one who has regretted their investment.